Pictured Events offers better than standard Photo Booth rentals as well as Open Air Interactive Green Screen photo booths for the Louisville KY., Southern Indiana and surrounding areas. Our photo booths are designed from the ground up with several distinct advantages and useful features that sets us apart from our competitors. INTRODUCING: HUGE SIZE (adjustable, up to 7'x7') with multiple Full Color Backgrounds of your choice!! First of all, our booths DO NOT look like a “vending machine” or "carnival / old style" booth like most other photo booths available. 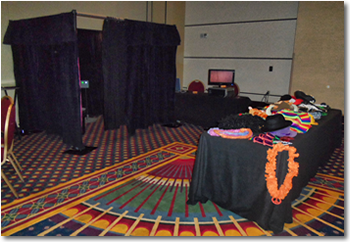 Our photo booths are simple and elegantly draped with rich, black theatrical drapery (we also have white) We also have optional color changable backgrounds or green screen backgrounds for use with ANY digital image. Do you really want a photo booth that looks like it was at the county fair at your nice, elegant wedding or special event? Our photo booths can fit in any space. Up to 7'x7' in size, it is not like a vending machine style photo booth which are only large enough for maybe two or three people at most. Larger booths = more people = more fun! Break the record and get your picture posted above! We utilize high-quality camera systems, studio grade lighting for broad even lighting and fast printers which print your photos before you can even put the free included props down. The booth automatically takes up to four poses with a short, few seconds delay in between each photo to allow you time to readjust......or make another silly face. A monitor inside of the booth prompts you with instructions and a count down and tells you when to smile. This monitor also "mirrors" the group in the booth so everyone can see themselves and adjust to fit in the photo. About 10 - 15 seconds after the photo cycle completes the photo is printed and ready. Is that fast enough? Each photo with all the poses taken, measures 4" x 6". There is also the added feature of having a "border area" around the mutiple poses/photos which is where we will customize this border to match your event with colors, designs, themes, names (ie: Thomas and Nancy's Wedding) or title of your event, even corporate logos for branding at company events. View sample prints here. There is no extra charge to add your logo or for graphic design services (within reason). All of the FUN is not just inside of the booth....outside of the booth there is a large external monitor which adds to ALL of your guest’s FUN by watching their friends that are inside the booth. Although not created to be set up outside due to heat, cold, moisture or extreme weather conditions our photo booths are fully portable and adjustable. The overall size can be adjusted to fit within the space available. If your event plans include a booth to be set up outside, we have a tent available as an option and it must be included with your chosen package (additional charges will apply). The booths are completely automated and an attendant will remain on-site with the booth at all times. We have several packages available which can all be tailored to fit your events needs. Click to view our package rates here. You may qualify for a discount! How will you know if you don't contact us before you book your next photo booth rental? A 50% retainer will be required to secure and reserve a date. Use the above reservation form with no money down to get started. No money is due until you mail the printed and signed copy. Reservation Form Instructions: If you already have an event date in mind? Select the form icon to the right and start by choosing a template for your graphics (can be changed later). Once your template is selected, the photo booth request form will open. Complete the form and click submit. You will then receive an email within 24 hours containing a retainer agreement using the information you provided on the form. Print, sign and mail the PDF attachment along with your retainer amount. If you prefer, call us at the number below to get started. 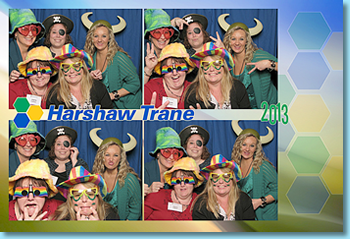 If you have ever used one of our Photo Booths at your event then you already know just how much fun they can be. Why not extend your fun by referring our booths to your friends and get paid? Are you an event or wedding planner? Want to add funds to your income? This is a simple way to earn money doing what you already do. Visit our Referral & Employment Page for more information and to get started. 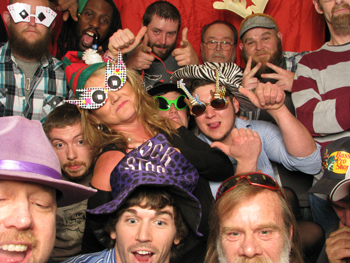 Photo Booth Rentals is a division of Pictured Events See our other Photo Booth website here. Ready to book a photo booth for your next event? Contact Us here or give us a call at 812-284-9557.